Looking for a smart, yet moisture-resistant, enduring flooring for your bathroom? Consider getting concrete flooring, for its various benefits and ability to handle environmental changes. It is highly functional, as well as a stylish choice for the interiors. The best part about concrete flooring is that, it suits any budget and can be designed according to your specifications. 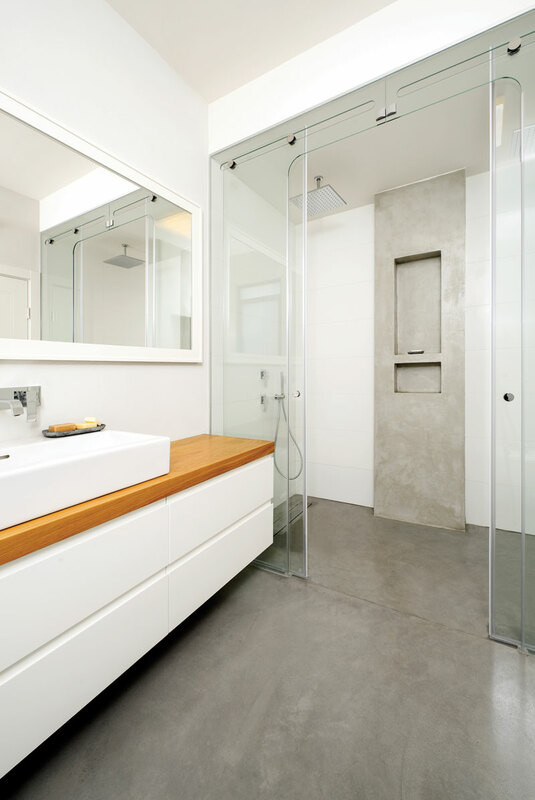 With little maintenance, you can have a sleek concrete bathroom floor. 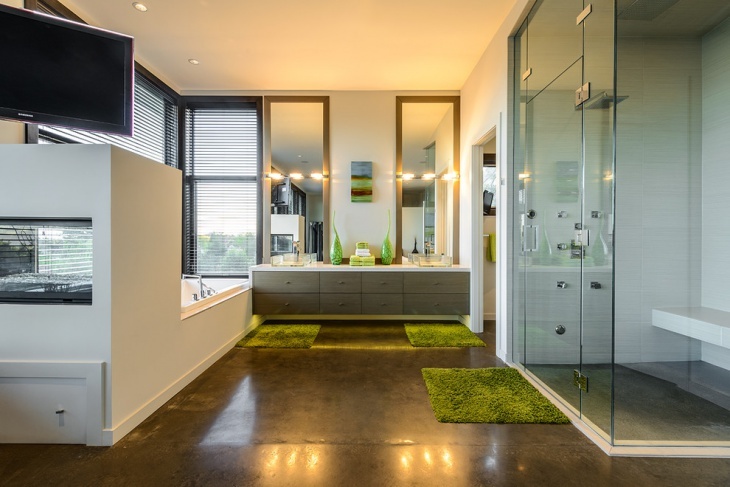 This open style concrete bathroom floor gets a trendy touch with staining. A hint of blue color adds an energetic feel to this neutral colored bathroom. Accentuate the look of your concrete bathroom floor with staining technique. You can add color, design or graphics with stains. You can apply stains to an existing floor or a new one. This subtle-colored stained concrete floor not only looks pleasant, but is also durable. Concrete also works for a shower floor, when sealed properly to avoid moisture from penetrating the soil. 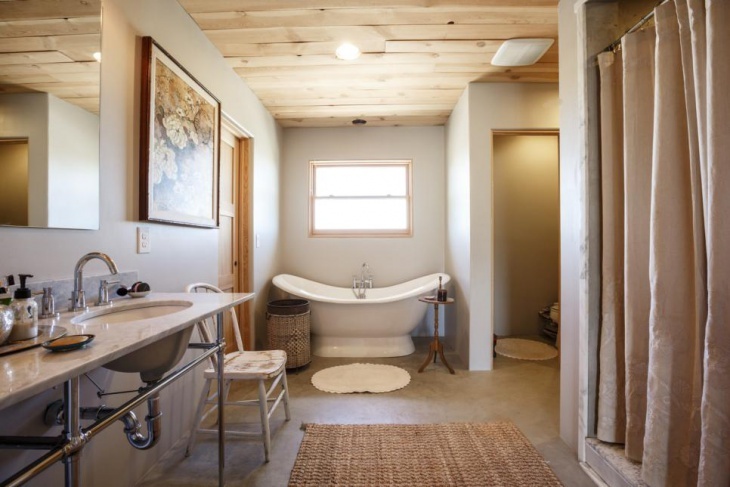 This is a great idea of using the same concrete floor for both bathroom and shower. The shower area is separated by sliding glass doors, creating a splendid look. This black polished concrete floor looks very chic. For the shower, the designer uses a porcelain tile to make it look like concrete. 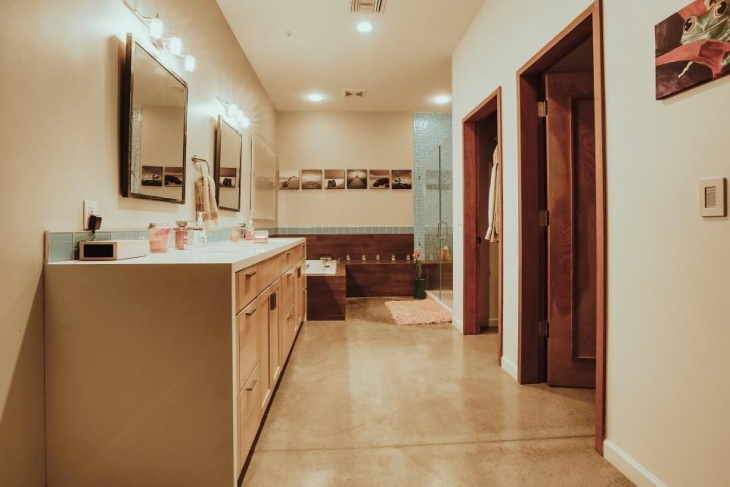 The dark color of the concrete floor and the wall suits the style of this bathroom. 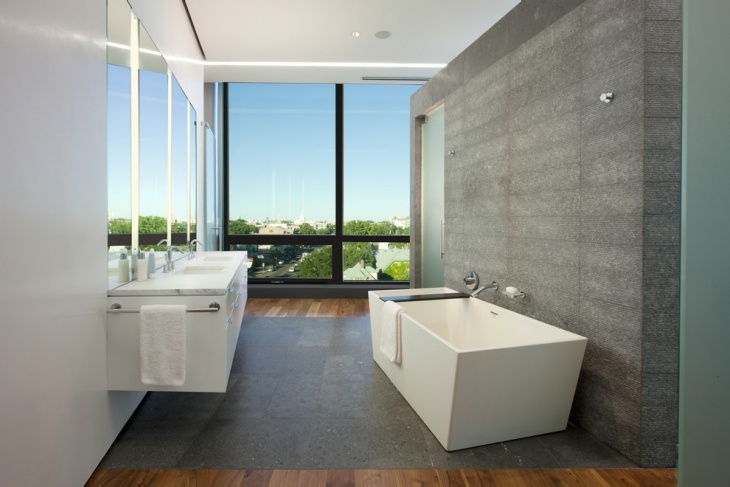 This uber-modern, sophisticated bathroom features polished concrete tiles. The concrete look tiles add a fine textural element to the bathroom and the shower floor as well. These tiles are popular for their natural look and low-maintenance qualities. With stamping technique, you can achieve crafty designs for your bathroom’s concrete floor. Wet concrete is stamped to create imprints of desired effect. This concrete vanity sink creates an elegant appeal. 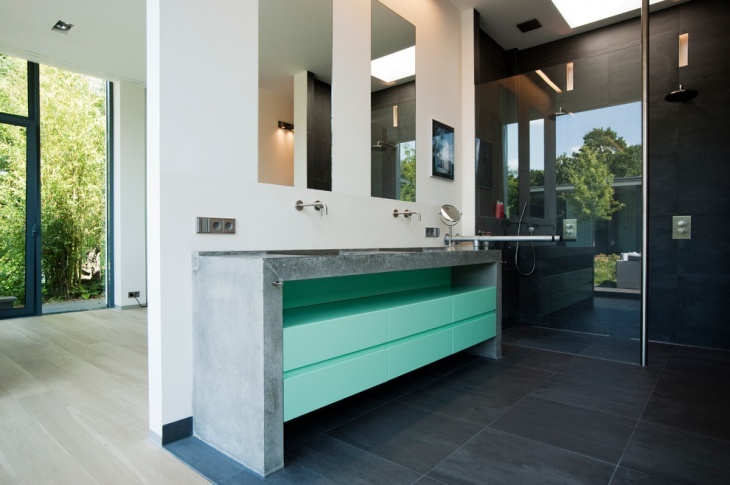 Concrete is an economical choice not only for bathroom floors and walls, but also for vanities. 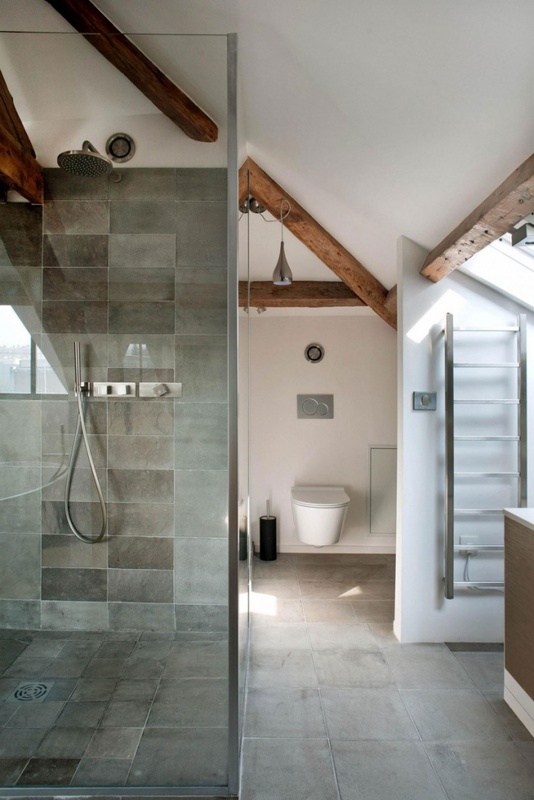 Stained concrete tiles are used here for shower. These concrete look tiles in earthy shades are used in multiple sizes to create a raw texture. 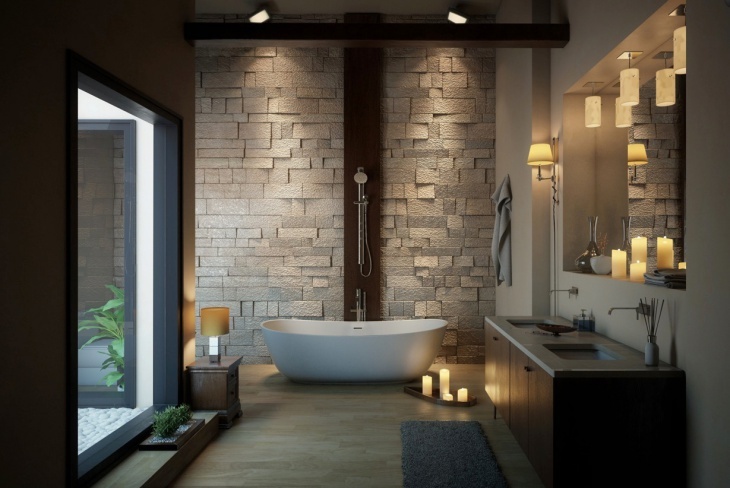 Tiles are no longer the only option, when it comes to bathroom walls. 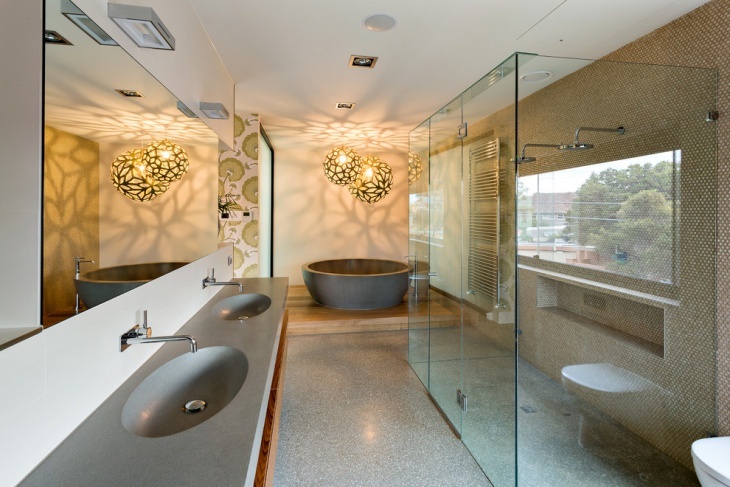 Polished concrete walls are a neat alternative for your bathroom that resists allergens. 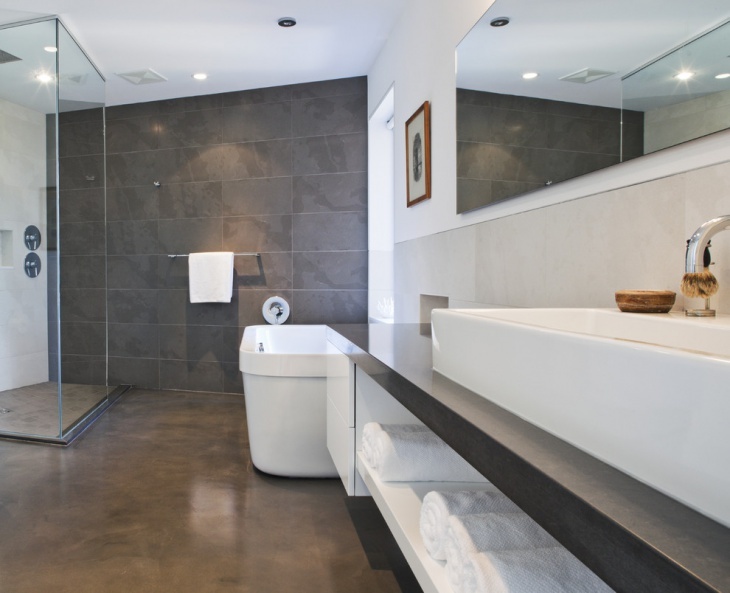 These dark grey concrete walls create a dramatic effect in the bathroom. 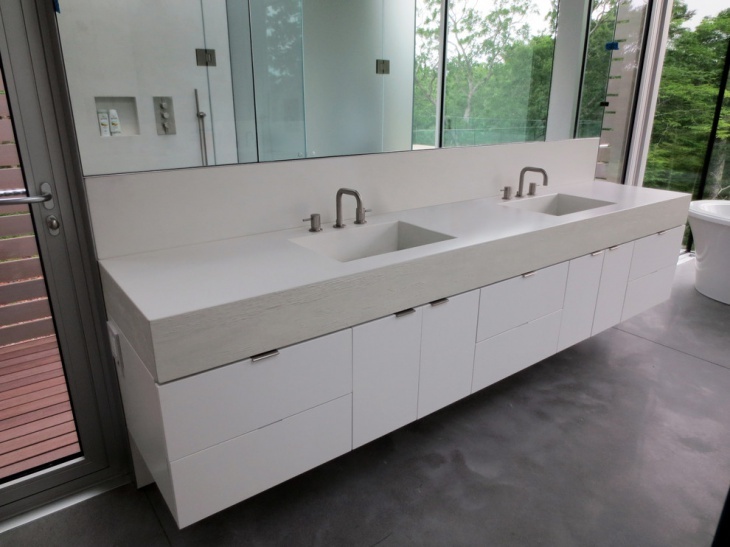 This concrete bathroom sink with double faucet makes a crisp, neat statement in this simplistic bathroom. Installing a DIY concrete floor for your bathroom is an easy project, when you follow the instructions. Mix concrete as specified until you achieve a thick batter-like consistency. Pour the mixture on the floor and keep leveling it using a gauge rake in order to coat it uniformly. After spreading it evenly, use a rubber squeegee to close minor gaps and smooth out peaks. If you find anything sticking out like wires, you can remove them once the concrete dries. You can also imprint any design after applying a finish coat, by stamping it. 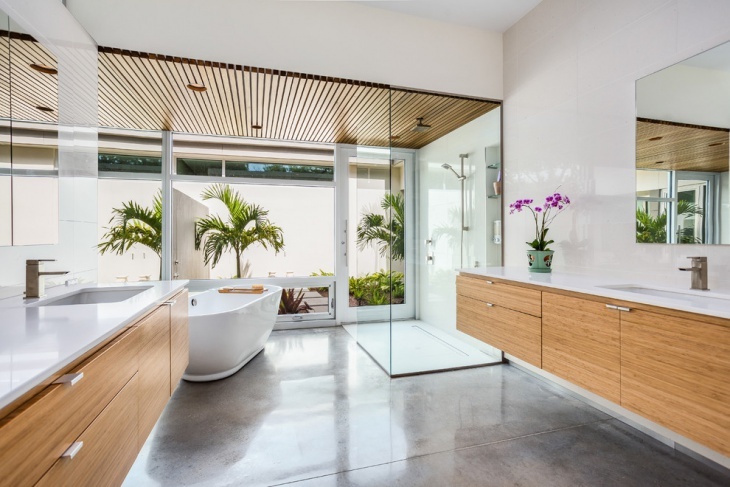 Concrete is a good choice for bathroom floors that are exposed to changes in humidity and staining elements. Concrete is ideal for providing radiant heat. 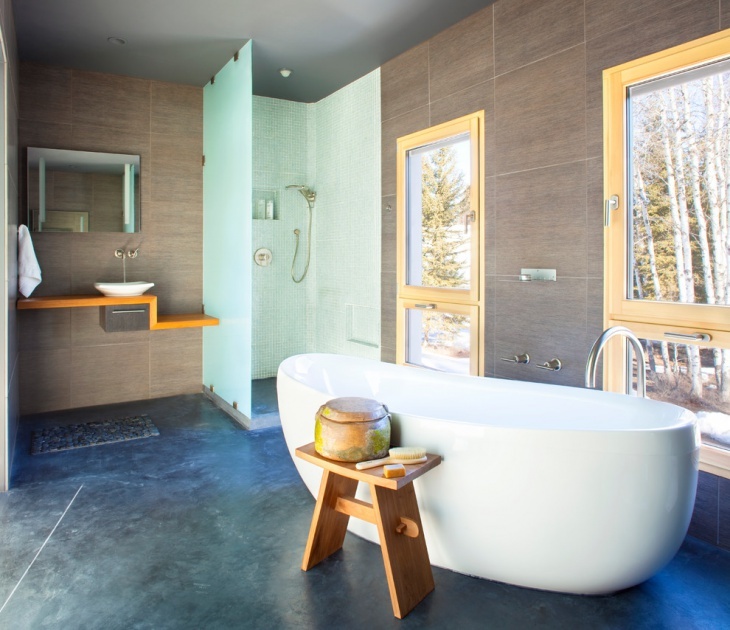 Concrete bathroom floors are long-lasting, low maintenance and very economical. Concrete bathroom floor looks equally appealing for overlays as well. The concrete’s blend and fine lines render a natural, stone-like feel. 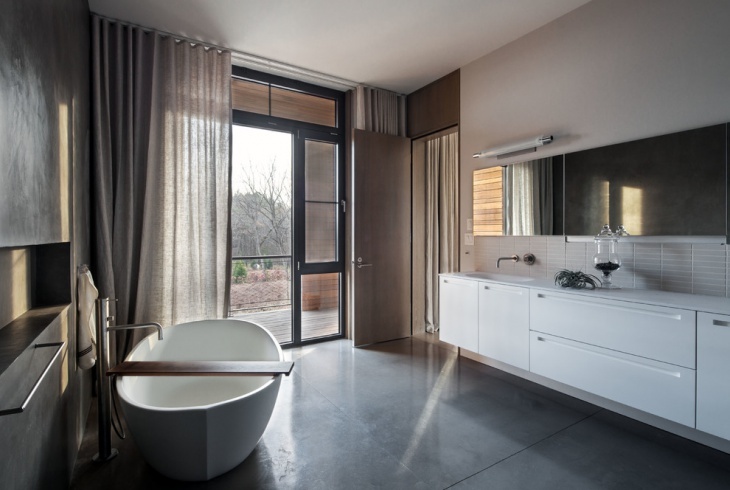 A polished concrete floor looks perfectly refined and refreshing for a bathroom.